It’s called Chicago Early Learning (CEL), formerly known as “Ready To Learn” or “Preschool for All.” The application window opened on April 30, 2018, and will stay open until seats are filled. Unlike CPS’s full-time, tuition-based pre-K (TBPK), which requires you to apply directly with each school for admission, the CEL program’s application process is centralized with application sites located throughout the city and tuition is based on a sliding scale. You can apply online at www.chicagoearlylearning.org and find out quickly if you have a spot or will be put on a waitlist. Many programs are half-day (2.5 – 3 hours), with morning and/or afternoon sessions available at each school, but CPS has been adding more full day options, so be sure to filter your search. Programs offer a well-rounded and evidenced-based curriculum with assessments to ensure students are on track for kindergarten. Tuition is on a sliding scale based on household income. Families can search for and review sites with the Find & Compare online tool, which can filter by hours, duration and program feature. Out of 600 school and community-based programs, each child may apply up to 2 sites but can only be accepted to one. Separate applications for each child can be made under a family’s account, but CPS cannot guarantee that siblings will be placed together. Chicago Early Learning does not include private schools, magnet, Montessori or tuition-based schools. How to apply: All Chicago residents, regardless of income, are welcome to apply for a seat to any CEL program location. Families can apply online, in person at one of several Family Resource Centers, or by phone at 312-229-1690. When applying online, there are 3 steps: 1) create an account, 2) fill in family employment and income info, child’s info and rank up to 2 program choices, and 3) if selected, you will be instructed how to verify your child’s spot. Verification requirements for CEL include: Proof of child’s age (children must be 3 or 4 years old and potty trained by September 1 of the entry school year), proof of residency, and proof of current income of parent(s) or guardian(s) of child. The City of Chicago prioritizes eligibility for these programs based on factors such as age, income, and child or family history. Families may be notified immediately if they are placed in a program or if they will be put on a waitlist. If a family is offered a spot to their top-ranked school, they will not be placed on a waitlist for their second-ranked school. Families have up to 2 weeks to “verify” placement by visiting a Family Resource Center. After verification, the final step is to enroll your child at the preschool site. Many parents across the city find the Chicago Early Learning preschool program not only affordable and convenient, but also a great way to transition children into a preschool curriculum with the flexibility of a shorter school day, if desired, plus more full-day options are being added. With many CEL programs housed in neighborhood and/or magnet schools, they're also a good way to help you determine whether a particular CPS school (or public school, in general) is a good fit for your child and your family. 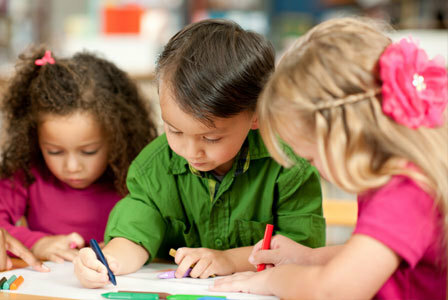 These programs do not guarantee admission to the participating school’s elementary program, however, unless that school is your assigned neighborhood school. Visit www.chicagoearlylearning.org for more information about the program and to access a complete list of program locations and application sites.